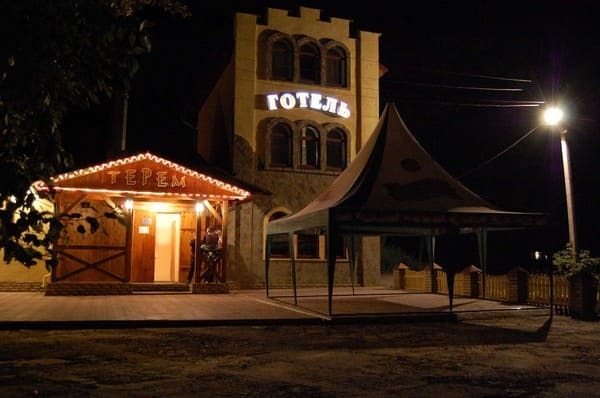 Hotel "Terem" is located in the center of the town of Izyum, opposite the bus station. 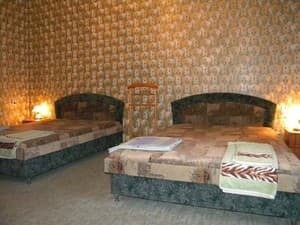 The hotel is decorated in a hunting style with a number of rooms 6 rooms of "standard" and "junior" categories. Each room is equipped with air conditioning, TV, bathroom with shower. 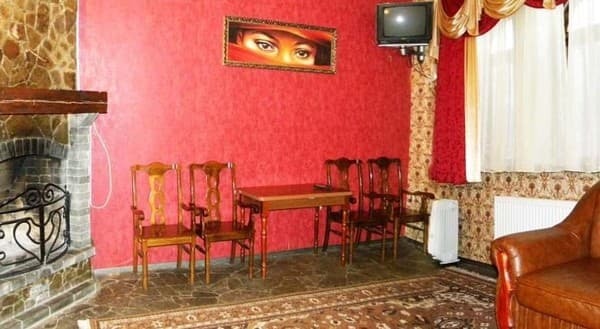 At the same time, the hotel can accommodate up to 20 guests. 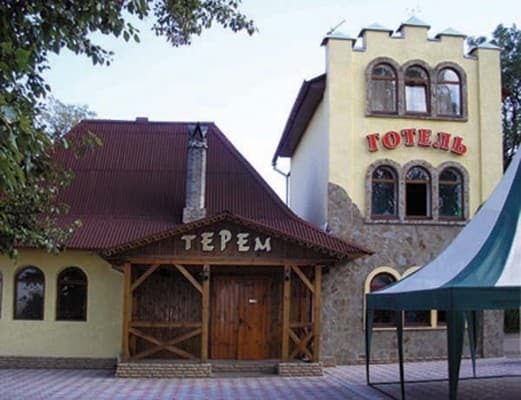 On the territory of the hotel "Terem" there is a cafe where you can taste dishes of Ukrainian and European cuisine and original seafood dishes. Also, there is a bar and a summer playground. Not far from the hotel is the Holy Ascension Cathedral (which houses the Miraculous icon of the Peschana Mother of God) and many historical and architectural attractions. The railway station is 4.6 km away. Distance to Kharkiv is 124 km away. 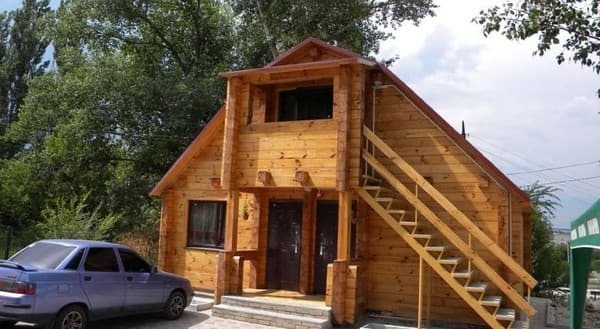 Description of the room: Comfortable single room, executed in a tree. The room is equipped with beds, an armchair, bedside tables, chairs, a wardrobe, a hanger and a shelf for shoes. Description of the room: One-room comfortable room is located on the 3rd floor. The room is equipped with beds, bedside tables with lamps, a sofa and a coffee table, chairs, clothes hangers and a shelf for shoes. Description of the room: One-room comfortable room is located on the 2 nd floor. The room is equipped with beds, bedside tables with lamps, a sofa and a coffee table, chairs, clothes hangers and a shelf for shoes. The cost of additional space 50 UAH. 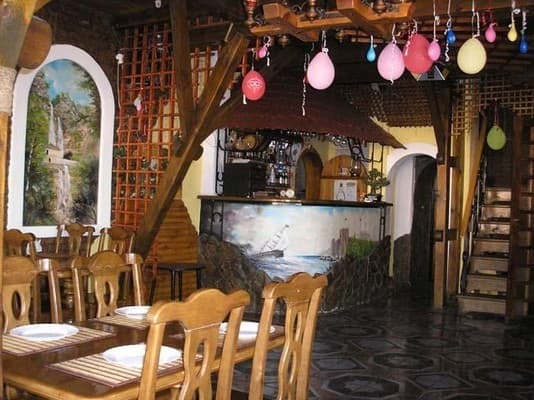 On the territory of the hotel "Terem" there is a cafe where you can taste dishes of Ukrainian and European cuisine and original seafood dishes. Also, there is a bar and a summer playground. 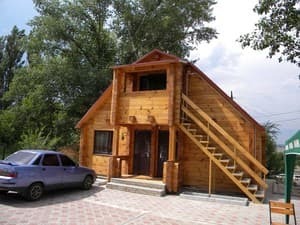 The mini-hotel is located in the center of Izyum opposite the bus station, next to the Lviv-Kiev-Kharkiv-Donbass-Rostov-on-Don highway. The railway station is 4.6 km away. The distance to Kharkov is 124 km. The hotel is located in the center of Izium in front of the bus station, the nearest address: Krasnogorsky lane.